Context: Intraoperative hypothermia is a leading cause of morbidity in the perioperative period. This retrospective audit study was planned to assess the efficacy of three different active warming devices used in maintaining euthermia in patients who underwent lower segment cesarean section (LSCS). Aims: Audit of the three different fluid warming techniques in maintaining euthermia in patients who underwent cesarean sections. Settings and Design: A retrospective audit. Materials and Methods: In total, 698 patients were included in the study who underwent LSCS and were divided on the basis of the warming technique used into Group 1 (n = 241, blood warming bath), Group 2 (n = 238, cabinet), and Group 3 (n = 219, inline warmer). The preoperative core body temperature was compared in each group with the intraoperative body temperature as well as with core body temperature measured 20 minutes after shifting the patient in the postoperative room as per the entries made in the central anesthesia registry. The incidence of the shivering was also noted from the data for each group separately. Statistical Analysis Used: One-way analysis of variance was applied for comparing the mean (SD) between the three groups and unpaired t-test was used to compare two mean (SD) values.P value <0.05 was considered significant. Results: Comparison of preoperative core body temperature (T0) with intraoperative (T1, T2) and postoperative (T3) temperatures within the groups showed significant results in Group 1 (blood warming bath), demonstrating its inefficiency in maintaining euthermia in the perioperative period. Conclusions: Cabinet and inline fluid warmer prove to be efficacious in maintaining euthermia and limiting shivering in the patients for cesarean section. Thermoregulation is a complex interplay of thermal inputs from central nervous system, midbrain, reticular formation, vagus, and spinal cord, converging at the thermoregulatory center (hypothalamus). Hypothalamus regulates the core temperature around 37°C (±0.2°C to ±0.4°C) to maintain normal physiological functions, as increase (>41.5°C) or decrease in temperature (<30°C) can lead to severe organ dysfunction and mortality. Hypothermia is defined as core body temperature below 36°C and is further classified as mild (34°C–36°C), moderate (32°C–34°C), and severe (<32°C). Inadvertent perioperative hypothermia (IPH) occurs in >50% patients undergoing short-duration procedures (≤1.5 hours). Mortality rate of 21% has been observed in patients with core temperature of <32°C. Complications associated with perioperative hypothermia include cardiac abnormalities, impaired wound healing, increased surgical site infections, shivering, delayed postoperative recovery due to slow drug metabolism, coagulopathies leading to increased bleeding, and blood transfusions. These complications lead to increased hospital burden due to prolonged stay and rise in treatment cost. IPH during lower uterine segment cesarean section (LSCS) is commonly seen in 91% of patient and the etiology is multifactorial. Perioperative warming of patients is an ongoing process involving active and passive techniques. 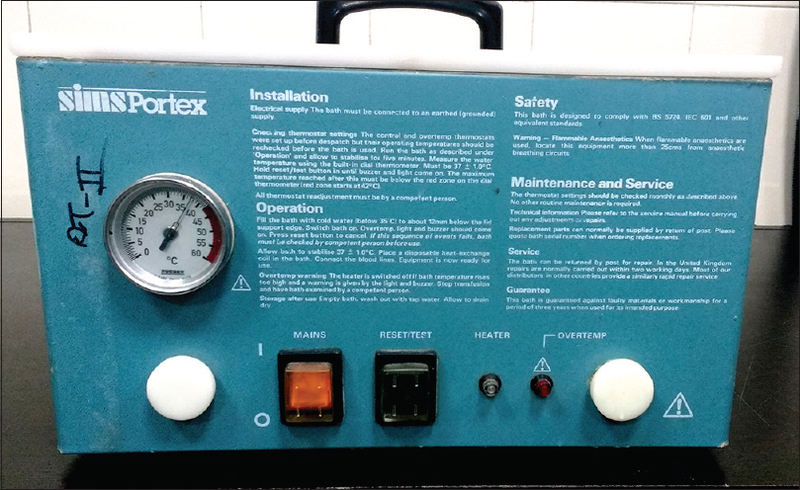 This equipment-based audit was planned as a quality assurance exercise to ascertain the efficacy of the three commonly used fluid warming techniques in maintaining perioperative euthermia and preventing shivering in patients who underwent LSCS. 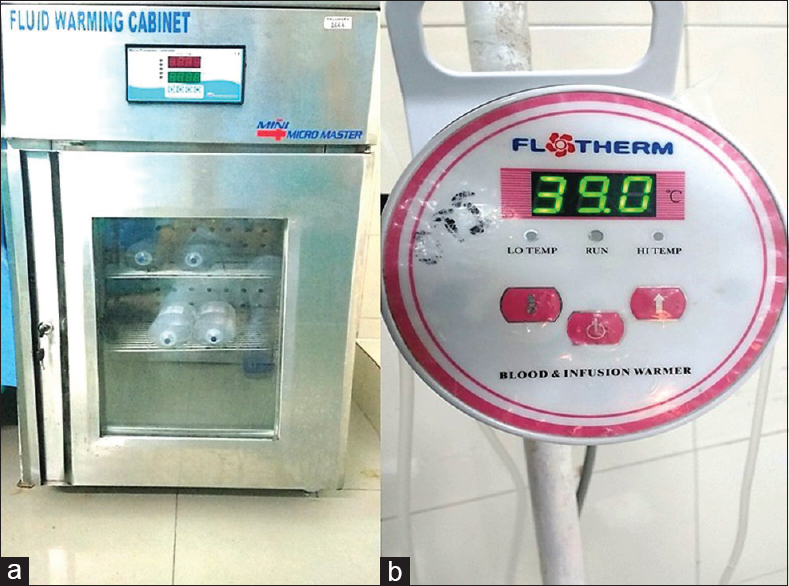 A retrospective audit was planned at our tertiary-care center after obtaining the clearance from the institutional review committee to analyze the effectiveness of three existing fluid warming techniques (blood warming bath, cabinet warmer, and inline warmer) commonly employed for patients who underwent LSCS for maintaining perioperative euthermia [Figure 1] and [Figure 2]a and [Figure 2]b. Key performance indicators for audit of warming efficiency of the three warming techniques were developed for the audit, keeping in mind the differences between the techniques. Temperature records were obtained from central anesthesia registry for the duration of January 2017 to December 2017. The primary outcome was to compare change in core temperature of the patients from preoperative to intraoperative period utilizing the aforementioned techniques. Secondary outcomes included difference in the change of temperature in preoperative and postoperative period as well as incidence of shivering among the three groups. The other measures that were recorded were maternal - age (years), body mass index (BMI) (kg/m2), American Society of Anesthesia physical status classes I and II, duration of surgery and operative room temperature. Patients with documented urinary tract infection, diabetic autonomic neuropathy, emergency cesarean section, and patients given general anesthesia or epidural anesthesia were screened out from the study. Temperature was measured by the ear thermometer (TH839S, OMRON Healthcare Singapore PTE Ltd, Alexandra Technopark, Singapore) in all the patients. Temperature values selected from the temperature records of the patient for this study were assigned as T0 (baseline temperature measured in the preoperative room and entered in the records), T1 (temperature reading recorded after performing the subarachnoid block and making the patient supine), T2 (temperature reading after completion of surgery and before shifting the patient to postanesthesia care unit [PACU]), and T3 (temperature measured and recorded after 20 minutes in PACU). All the patients who underwent LSCS were taken to the preoperative room and were attached with the standard monitors (noninvasive blood pressure, peripheral capillary oxygen saturation [SpO2], electrocardiography, and ear thermometer) and all baseline parameters were recorded in the central anesthesia registry. Patients screened eligible for this study were all preloaded as per our departmental protocol with the prewarmed crystalloids (ringer lactate 10 mL/kg) after ruling out any contraindications to the preloading. The incidence of shivering was noted during postoperative period from the anesthesia records. As an institutional protocol temperature of all patients are recorded after 20 minutes in PACU and the reading were obtained in our study from the anesthesia central registry. Data of temperature records were collected and segregated on the basis of the method of warming technique being utilized. Group I (blood warming bath) [Sims portex blood warming bath, model no BW1, Portex Ltd., Hythe Kent, England] included patients who received warm fluid from water bath set at 37°C, Group II (Cabinet group) [Mini micro master fluid warming cabinet, model no WCD 2448 SD, India] included patients who received warm fluids from warming cabinet that were warmed at 41°C for minimum of 8 h, and patients in Group III (Inline fluid warmer) [Flotherm blood and infusion warmer model no QW618, Keewell Medical Technology Co Ltd., China] received warm fluids through inline warmer at 39°C. The operative room ambient temperatures were measured by OPTILAB Clock and hygrothermometer (model THC-10). Statistical analysis of the data was done by applying one-way analysis of variance (ANOVA) test when comparing the mean (SD) between the three groups. Greenhouse-Geisser correction, which detects the index of sphericity, was applied to study the interaction between the groups. An “unpaired t-test” was applied comparing the two different mean (SD) values. Analysis was performed using Statistical Package for Social Sciences, version 20 (SPSS, Inc, Chicago, IL, USA) software. P value <0.05 was considered significant. After analyzing the past temperature records obtained from the central anesthesia registry for the duration of January 2017 to December 2017, a total of 698 patients qualified the inclusion criteria of the study, which were further divided into three groups. Group I (blood warming bath, n = 241), Group II (cabinet, n = 238), and Group III (inline, n = 219). Demographic data when compared between the groups showed significant results when age and BMI were compared between the groups with P value of 0.01 [Table 1]. This is primarily due to the heterogenicity and skewed distribution of the data as the study being a retrospective analysis. Mean (SD) duration of the surgery when compared between the groups was not significant with P value of 0.87 [Table 1]. Mean (SD) temperature in Celsius of the operation theater of all the three groups on comparison showed P value of 0.091 [Table 1]. Greenhouse-Geisser correction when applied to analyze the interaction between the groups revealed insignificant results. So, we proceeded with the comparison within the groups at varying time intervals and repeated ANOVA was applied. Preoperative core body temperature (T0) measured by the ear thermometer (TH839S, OMRON Healthcare Singapore PTE Ltd.) when compared with the temperature measured after the administration of the spinal anesthesia (T1) within each group showed significant results in Group 1 (blood warming bath) with P value of 0.01 and the results in other two groups were not significant [Table 2]. Similar results were obtained when T0 was compared with the core body temperature measured after completion of the surgery intraoperatively (T2) with P value of 0.01 in Group 1 (blood warming bath) and statistically insignificant results in Group 2 (cabinet) and Group 3 (inline warmer) [Table 3]. Group 1 (blood warming bath) showed significant results (P-value of 0.01), when T0 was compared with core body temperature measured postoperatively after 20 minutes (T3). Group 2 (cabinet) and Group 3 (inline) comparing the T0 with T3 within the group showed results that were statistically insignificant [Table 4]. Post hoc power calculation was applied to all the mean difference of the groups in the study comparing the temperature T0 with T1, T2, and T3, respectively. It was found to be adequate >80% in Group 1 and Group 2; however, Group 3 results were underpowered (43%) due to the minimal change in the temperature difference [Table 1],[Tables 2],[Tables 3, [Tables 4]. About 31% patients reported shivering perioperatively in Group 1 (blood warming bath). Shivering incidence was 9.6% and 9.5% in Group 2 (cabinet warmer) and Group 3 (inline warmer), respectively. Incidence of hypothermia and shivering is reported to be around 85%–91% in patients undergoing lower segment cesarean section (LSCS)., Contributing factors include long duration of labor, exposure to cold environment during transportation, administration of crystalloids at the room temperature, and exposed abdomen during the surgery. Bhattacharya et al. has shown that fall of core body temperature from 35.5°C to 34.5°C results in the increased incidence of shivering from 50% to 90%. Preloading with crystalloids at room temperature is a well-established practice to prevent postspinal hypotension, nausea, and vomiting in patients listed for LSCS, but it can lead to a decrease in the core body temperature by 0.25°C., As a routine, in our institute, preloading is done in the preoperative room with the prewarmed crystalloids drawn from the cabinet warmer stationed centrally. Tander et al. had demonstrated in their study a reduced incidence of maternal IPH, shivering, and neonatal hypothermia with the administration of the warm fluids. Various methods are employed for patient warming that includes both active and passive techniques to prevent IPH. Passive warming involves covering patients with cotton sheets, sterile drapes, foil blankets, warm blankets, and maintaining the ambient operation theater (OT) temperature. Electric radiation system, heated water mattress, forced air warming, irrigation of open body cavities with warm fluids and venous infusion of heated fluids are few among the known active warming techniques. This retrospective study was planned to analyze the active warming techniques employed in the obstetric cases listed for LSCS and their relative efficacy in maintaining the core body temperature. Active warming techniques have a positive impact during LSCS by minimizing maternal shivering, hypothermia, and positive effect on the neonatal pH. Study results were significant when the preoperative core body temperature (T0) was compared with the intraoperative temperatures (T1 and T2) in Group 1 (blood warming bath) and similar results were obtained when the T0 temperature was compared with the T3 temperature measured in PACU [Tables 2], [Tables 3],[Tables 4]. The results obtained from the other two groups, Group 2 (cabinet) and Group 3 (inline), were not significant implying that the preoperative core body temperature did not vary significantly when compared intraoperatively as well as postoperatively in PACU indicating toward efficacy of these warming methods [Table 2], [Table 3], [Table 4]. The likely reason for not maintaining core body temperature in Group 1 may be because, in blood warming bath, the preset temperature control is set to maintain water temperature of 37°C. At low flow rates, the outlet blood/fluid temperature is approximately the same as the temperature of bath. At higher flow rates, the outflow temperature decreases and flow rate of 100 mL/minute is associated with decrease in the outflow temperature, which is <37°C but >32°C. Chung et al. have shown that intraoperative use of warm fluids and maintenance of ambient OT temperature have reduced the incidence of IPH and shivering. 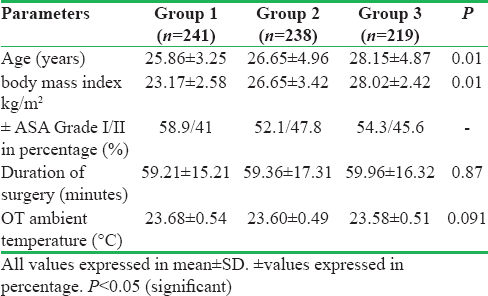 Mean (SD) ambient OT temperature, when compared within the three groups, varied between 23.58 (0.51)°C and 23.68 (0.54)°C, which was not significant [Table 1]. Contradictory studies exist, one favoring the prewarming of obstetric patient for LSCS with forced warm air device and the other showing the negative results with the device in preventing the maternal hypothermia and its effects., However, Benjamin et al. confirmed decreased incidence of hypothermia and shivering in patients when given warm fluids along with forced warm air as compared with patients who received none. Our results were in conjunction with the study by Andrzejowski et al. who compared prewarmed fluids from cabinet with inline fluid warmer and found both to be equally effective in preventing maternal hypothermia and shivering. The factors responsible for IPH during spinal anesthesia (SA) are different as compared with general anesthesia. High level of spinal block and advance age are main predictors of hypothermia under SA. The core temperature said to decrease by 0.03°C for each year increase in age and by 0.06°C for each dermatome level blocked. Shivering threshold is reduced by about 0.6°C and vasomotor tone are inhibited below the level of the spinal block through somatic neural and sympathetic blockade predisposing patients to hypothermia., In contrast to neuraxial blocks, duration of surgery, quantity of blood loss, body hiatus, and ambient OT temperature are common predictors of hypothermia under GA. Incidence of perioperative shivering was highest about 31% in Group 1 followed by Group 2 (9.6%) and Group 3 (9.5%). This could be explained by the fall in the temperature of the crystalloid delivered at the patient end at the faster rate when the fluids administered were prewarmed in the blood warming bath. Shivering has a deleterious physiological effect on the body and can increase the oxygen consumption manifold with increased incidence of bleeding, delayed wound healing, and difficulty in monitoring. Limitations of the study include, being a descriptive study, the heterogenicity of the groups led to the skewed distribution of the data. There was no mention of the dermatome level blocked as the level of block has a direct bearing on the fall of core temperature. Inferences drawn in respect to the third group were limited; this was due to the lack of the power calculated by post hoc analysis requiring a bigger sample of the population. In view of the results, this study gives us the insight into the importance of active warming methods in maintaining the perioperative euthermia in the OT especially during LSCS under SA as the anesthesia technique per se can have an adverse impact on the core temperature leading to maternal hypothermia and affecting the neonatal pH. Hence, a larger randomized controlled study will be required to establish the efficacy of these active warming devices in the clinical practice. This study proved to be a quality assurance exercise that helped us in formulating our institutional protocols based on National Institute for Health and Clinical Excellence guidelines and all fluids and blood products are henceforth administered at 37.0°C. Prewarmed fluid from a cabinet or inline fluid warmer has been found to be a viable and effective means of active warming methods available that are helpful in preventing and limiting the maternal hypothermia and its sequelae, thereby decreasing the incidence of postoperative morbidity. Galvao C, Liang Y and Clark A. Effectiveness of cutaneous warming systems on temperature control: Meta-analysis. J Adv Nurs2000;66:1196-206. Prevention of inadvertent perioperative hypothermia. Pa Patient Saf Advis 2008;5:44-52. Tsuei BJ, Kearney PA. Hypothermia in the trauma patient. Injury 2004;35:7-15. Leaper D, Kumar S and Bettles N. Maintaining normothermia during surgery The Clinical Services Journal 2005;4. Kurz A. Thermal care in the perioperative period. Best Pract Res Clin Anaesthesiol, 2008;22:39-62. Cobb B, Cho Y, Hilton G, Ting V, Carvalho B. Active warming utilizing combined IV fluid and forced-air warming decreases hypothermia and improves maternal comfort during cesarean delivery: A randomized control trial. Anesth Analg. 2016;122:1490-7. Roy JD, Girard M, Drolet P. Intrathecal meperidine decreases shivering during cesarean delivery under spinal anesthesia. Anesth Analg 2004;98:230-4. Bhattacharya PK, Bhattacharya L, Jain RK, Agarwal RC. Post anaesthesia shivering (PAS): A review. Indian J Anaesth. 2003;47:88-93. Bajwa SS, Kulshrestha A, Jindal R. Co-loading or pre-loading for prevention of hypotension after spinal anaesthesia! A therapeutic dilemma. Anesth Essays Res 2013;7:155-9. Gentilello LM, Cortes V, Moujaes S, Viamonte M, Malinin TL, Ho CH, et al. Continuous arteriovenous rewarming: Experimental results and thermodynamic model simulation of treatment for hypothermia. J Trauma 1990;30:1436-49. Tander B, Baris S, Karakaya D, Ariturk E, Rizalar R, Bernay F. Risk factors influencing inadvertent hypothermia in infants and neonates during anesthesia. Paediatric Anaesthesia 2005;15:574-9. Danczuk RFT, Nascimento ERP, Silveira NR, Hermida PMV, Rasía MA. Heating methods in the prevention of intraoperative hypothermia of elective abdominal surgery. Esc Anna Nery 2015;19:578-84. Chung SH, Lee BS, Yang HJ, Kweon KS, Kim HH, Song J, et al. Effect of preoperative warming during cesarean section under spinal anesthesia. Korean J Anesthesiol 2012;62:454-60. Butwick AJ, Lipman SS, Carvalho B. Intraoperative forced air-warming during cesarean delivery under spinal anesthesia does not prevent maternal hypothermia. Anesth Analg 2007;105:1413-9. Benjamin C, Cho Y, Hilton G, Ting V, Carvalho, B. active warming utilizing combined iv fluid and forced-air warming decreases hypothermia and improves maternal comfort during cesarean delivery: A randomized control trial. Anesth Analg 2016;122:1490-7. Andrzejowski JC, Turnbull D, Nandakumar A, Gowthaman S, Eapen G. A randomised single blinded study of the administration of pre-warmed fluid vs active fluid warming on the incidence of peri-operative hypothermia in short surgical procedures. Anaesthesia 2010;65:942-45. Kurz A, Sessler DI, Schroeder M, Kurz M. Thermoregulatory response thresholds during spinal anesthesia. Anesth Analg 1993;77:721-6. Alfonsi P. Postanaesthetic shivering. Epidemiology, pathophysiology and approaches to prevent and management. Minereva Anestesiol 2003;69:438-1. Emerick TH, Ozaki M, Sessler DI, Walters K, Schroeder M. Epidural anesthesia increases apparent leg temperature and decreases the shivering threshold. Anesthesiology 1994;81:289-98. Matsukawa T, Sessler DI, Sessler AM, Schroeder M, Ozaki M, Kurz A. Heat flow and distribution during induction of general anesthesia. Anesthesiology 1995;82:662-73. Mathews S, Al Mulla A, Varghese PK, Radim K, Mumtaz S. Postanaesthetic shivering-A new look at tramadol. Anaesthesia 2002;57:394-8. Clinical practice guideline. The management of inadvertent perioperative hypothermia in adults. National COLLABORATING Centre for Nursing and Supportive Care commissioned by National Institute for Health and Clinical Excellence (NICE): April 2008. http://www.nice.org.uk/ nicemedia/pdf/CG65Guidance.pdf. [Last accessed on 2018 Aug 08]. Chue AL, Moore RL, Cavey A, Ashley EA, Stepniewska K, Nosten F, et al. Comparability of tympanic and oral mercury thermometers at high ambient temperatures. BMC Res Notes 2012;5:356.